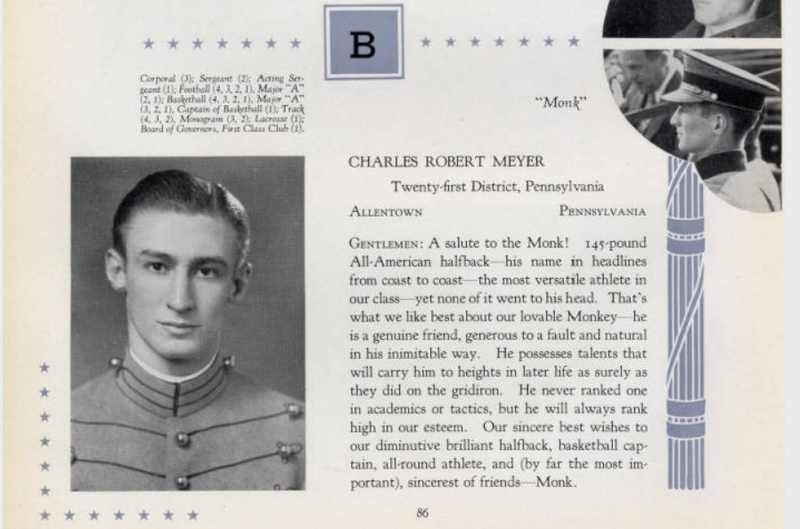 Charles “Monk” Meyer earned a pair of varsity letters in football, three in basketball and one in lacrosse during a stellar athletic career at West Point. 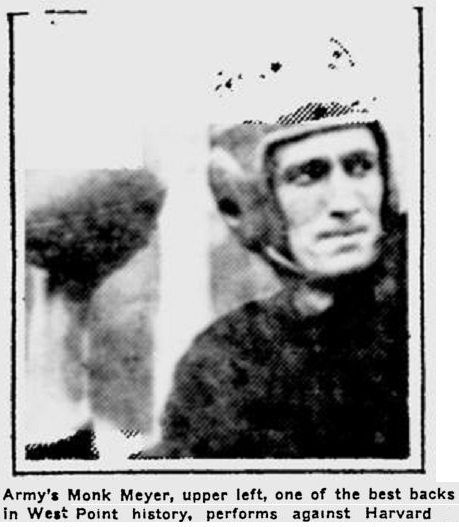 He finished second in the initial Heisman Trophy voting to Jay Berwanger of the University of Chicago and retired from the U.S. Army with the rank of Brigadier General. 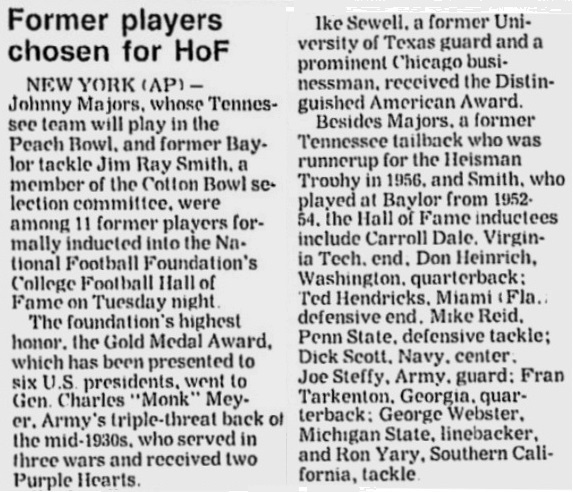 Meyer received the Silver Anniversary Award from Sports Illustrated in 1961 and collected the Gold Medal Award from the National Football Foundation 1987. 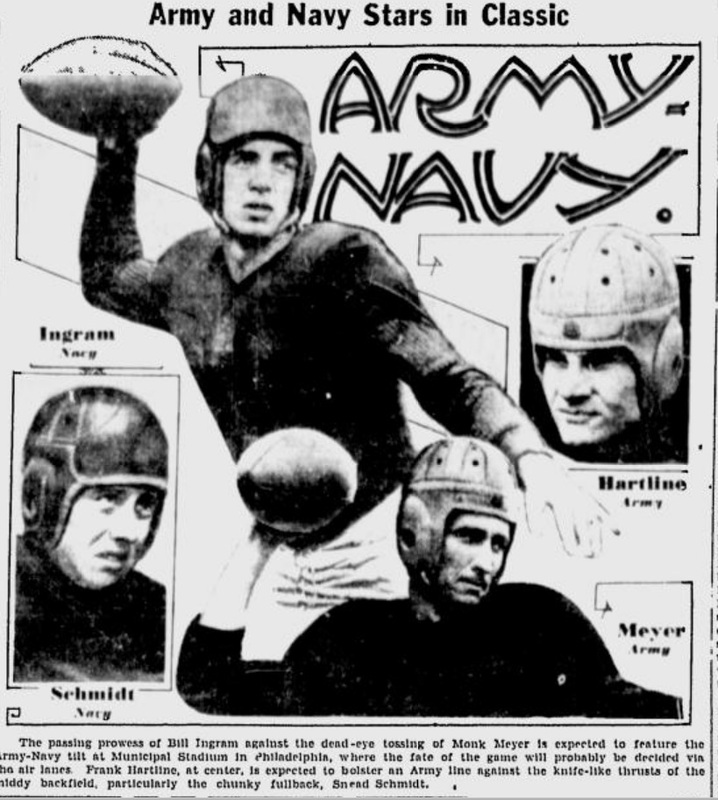 As a standout quarterback, Meyer helped Army to a 28-6 victory over Navy in 1935 at Philadelphia’s Franklin Field and played in the 1937 College All-Star Game. 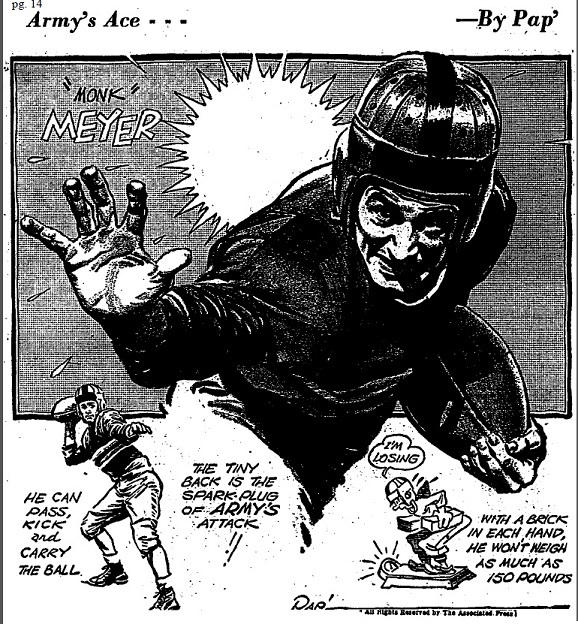 Among Meyer’s single-game highlights was a 172-yard passing performance during a 27-16 victory opposite Columbia and future National Football League Hall of Fame quarterback Sid Luckman in 1936. Meyer helped Army to six wins in each of his two seasons. On the hardwood, Meyer earned three varsity letters. He served as team captain in 1937 and contributed to squads that posted a combined 24-18 record, including a pair of wins opposite service academy rival Navy. 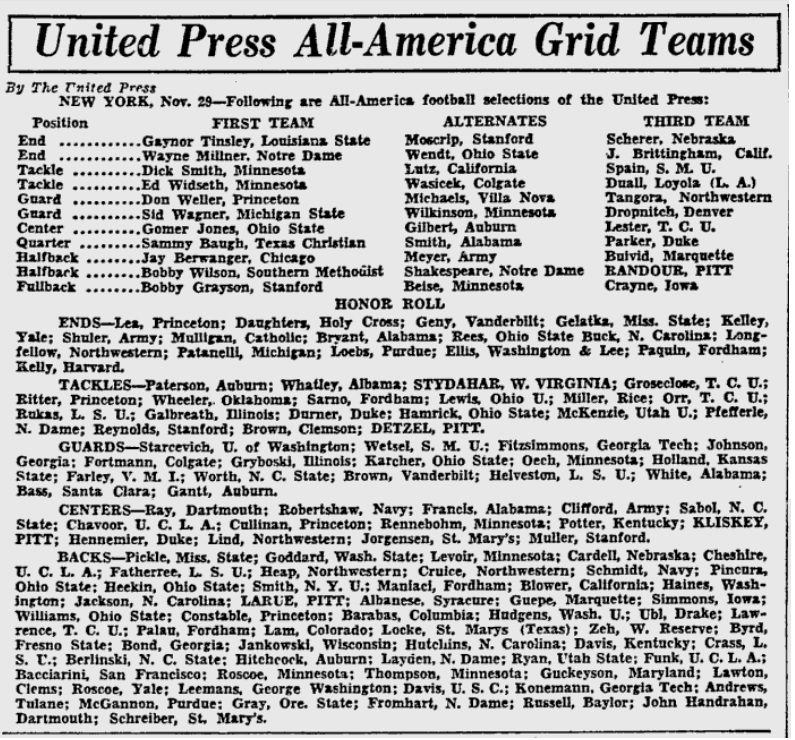 Meyer was also a member of Army’s lacrosse team and earned a varsity letter in 1937. The Black Knights finished 9-1 that season and ended the year with a 6-5 victory at Navy. Wins against Hobart, Yale, Syracuse, Penn State and Johns Hopkins also highlighted the campaign. 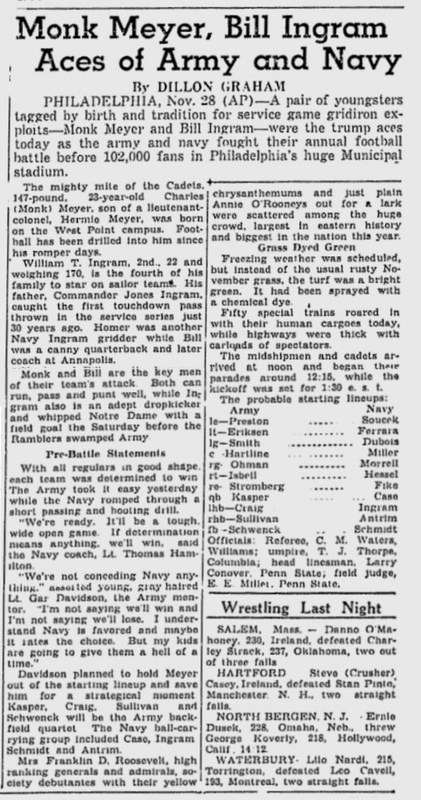 Allentown High alumnus led Army against Notre Dame 75 years ago this week. When Army and Notre Dame meet for the 50th time on Saturday in the new Yankee Stadium in New York, all the history and lore that surround this colorful collegiate rivalry will spring to life. 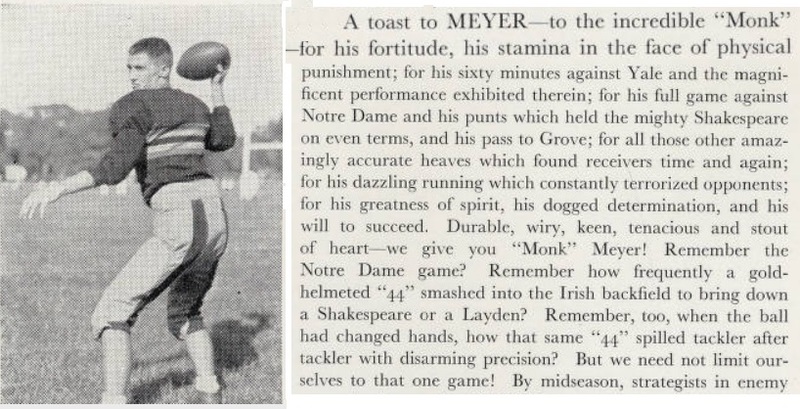 “Cheer, cheer for old Notre Dame” with the legendary George Gipp in 1919 and 1920. Notre Dame’s Four Horsemen of 1924 and Grantland Rice’s classic lead to his story on the game, “Outlined against a blue, gray, October sky the Four Horsemen rode again.” And Notre Dame coach Knute Rockne’s inspirational halftime “Win one for the Gipper” pep talk in 1928 that resulted in an upset Irish victory. “On, Brave Old Army Team” with coach Earl “Red” Blaik’s powerful and undefeated war-time machine led by Doc Blanchard “Mr. Inside” and Glenn Davis “Mr. Outside” of 1944-46. It was when three All-Americans — halfbacks Pete Dawkins, Bob Anderson and Northampton’s Bob Novogratz at guard — led a Black Knight conquest in 1958. And 75 years ago this year in the 1935 contest, it was Allentown’s Charles “Monk” Meyer of Army whose name was added to this golden honor roll. Although small in stature at 5-9 and 150 pounds, and looking more like the team’s student manager, “Monk” Meyer was indeed a West Point football star. And like many other Army graduates, he went on to display heroism on the battlefield for his country. Charles Robert “Monk” Meyer played football, basketball and baseball at Allentown High School for the nationally recognized coach, J. Birney Crum. 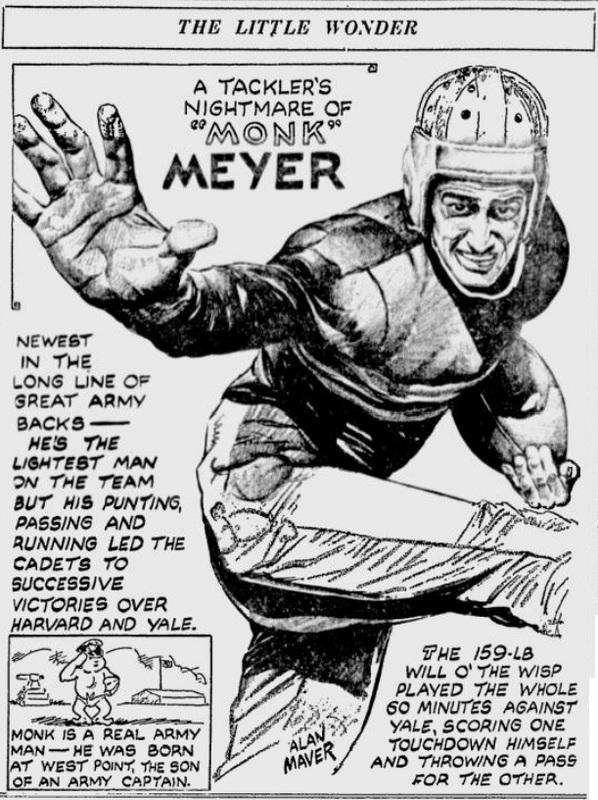 As a single-wing halfback in 1930, Meyer was the club’s top scorer with 12 touchdowns as he helped the Canaries to a perfect 11-0 season. 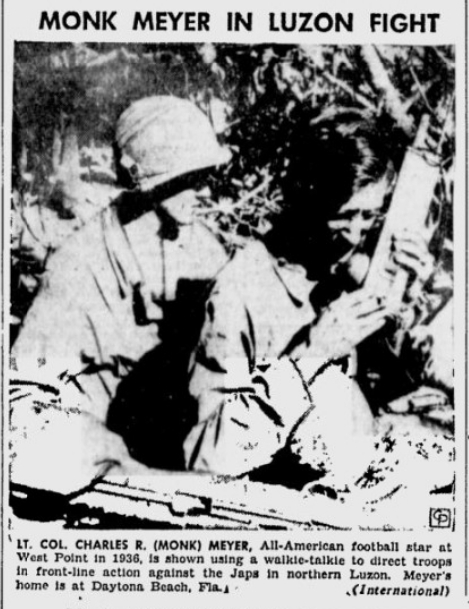 As the son of Lt. Col. Hermie Meyer and born at West Point, N.Y., on May 1, 1911, “Monk” was tagged by birth and tradition to serve his country with a career in the military. Monk grew up at various Army bases throughout the nation and even in the Philippines as his father received assignments during his military career. The Meyer family relocated to the Lehigh Valley area in time for Monk to play football, basketball and baseball at Allentown High. 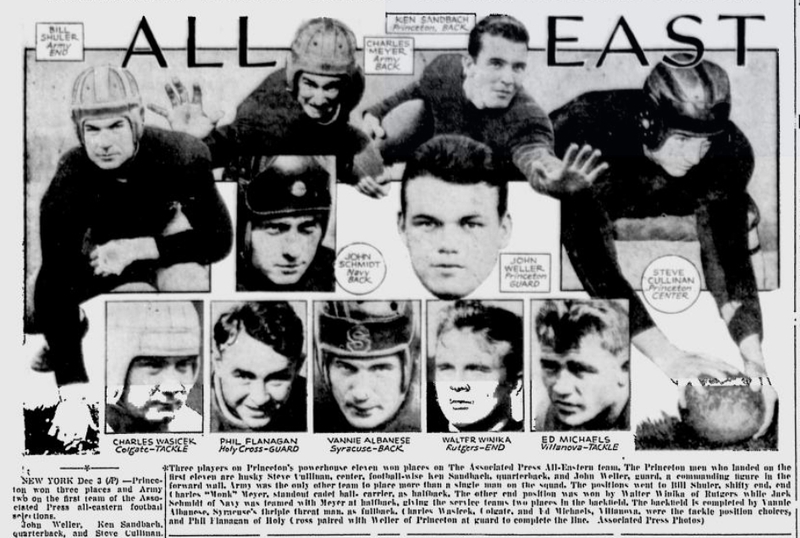 After leaving Allentown High, Meyer prepped at Philadelphia’s Chestnut Hill Academy and entered West Point in 1933 as a player who could run, pass, kick and play defense. For two seasons, 1935 and 1936, the “150-pound Mighty Mite” was the big gun of the Army attack for coach Gar Davidson. In 1935 against Notre Dame before a capacity crowd of 78,114 in Yankee Stadium, it was Meyer’s 41-yard first-quarter TD pass and stellar performance in a 6-6 tie that brought him into the limelight. 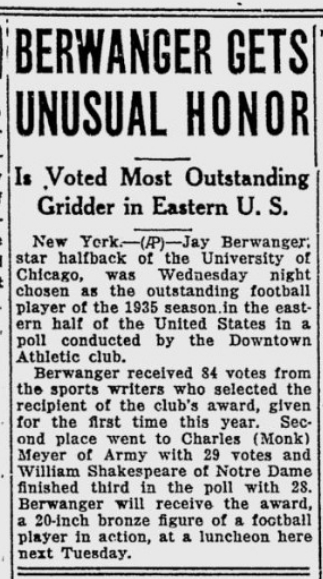 The press recognition eventually led to his All-American mention and then to his being named runner-up to the University of Chicago’s Jay Berwanger in the first-ever Heisman Trophy vote that year. However, Meyer’s fondest memory of the season was the stalemate with the Fighting Irish and what happened after the game. Meyer said he was resting by the locker-room door when someone started knocking on it. Opening the door, Meyer was startled to see Notre Dame head coach Elmer Layden, one of the immortal Four Horsemen, along with Irish players. Meyer then called over some of his teammates to verify to Layden that he indeed was Monk Meyer. In 1936, Monk had another big day in Yankee Stadium. 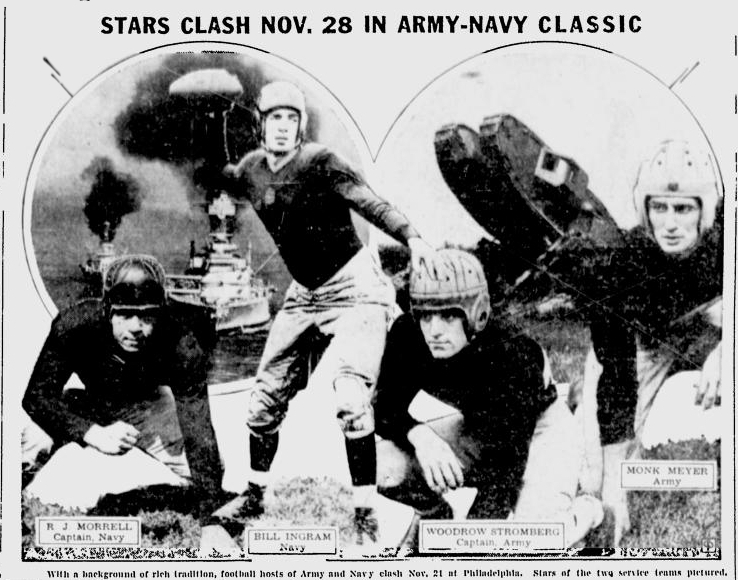 This time the Army ace outdueled famed Columbia passer and future Chicago Bear Hall of Fame quarterback Sid Luckman as the Black Knights prevailed, 27-16, over the Lions. 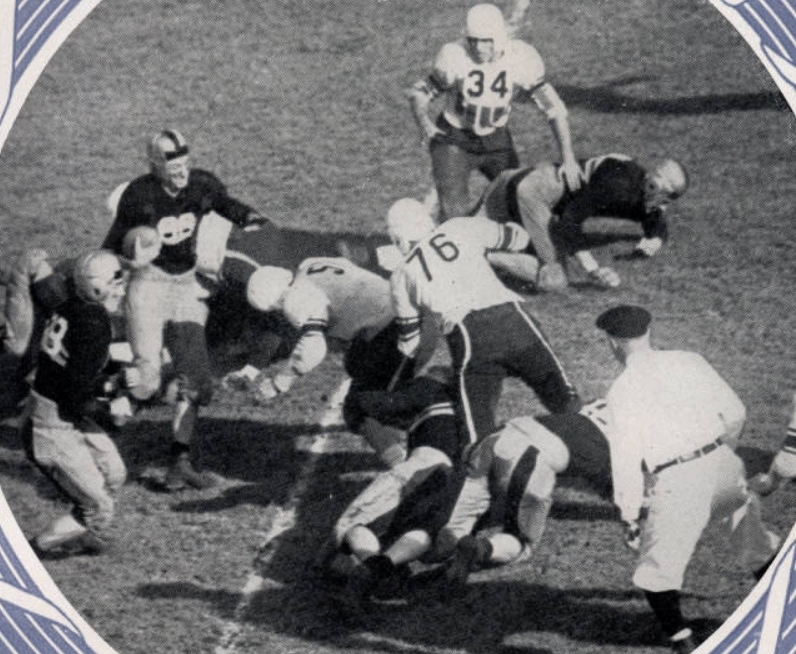 In the book, “Coach Birney Crum and Allentown High,” attorney Ray Brennen, Meyer’s Allentown High classmate and lifelong friend, said of him: “He almost didn’t have a football career at Army let alone the resulting fame and honors because he was just one of over a hundred players trying out for the team when he got to West Point and a little guy to boot. Meyer graduated from West Point in 1937 and led troops in the Pacific Theater under the overall command of Gen. Douglas MacArthur during World War II and again in Korea, and was wounded twice. Among the numerous decorations he received were two Silver Stars and, for “extraordinary heroism,” the Distinguished Service Cross. It is the second-highest decoration in the United States, just below the Medal of Honor. This entry was written by forwhattheygave, posted on September 22, 2007 at 5:38 pm, filed under Army Athletes, Army Greats, Army Navy Football and tagged Basketball, Football, Lacrosse, Track. Bookmark the permalink. Follow any comments here with the RSS feed for this post. Trackbacks are closed, but you can post a comment.